Black China - 251 items found. 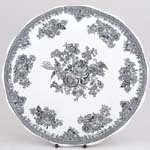 By G L Ashworth & Bros, owners of Masons, printed in grey/black this was actually part of the Gonville and Caius College, Cambridge dinner service. On the back printed within a circle is J Fuller or possibly J Fidler. This dish is crazed and has some staining around two of the stilt marks and to the rim. There is a hairline affecting the rim and side of the dish. The underside of the dish shows signs of wear. Made by G L Ashworth & Bros, owners of Masons, printed in grey/black this was actually part of the Gonville and Caius College, Cambridge dinner service. Impressed date mark 9 over 94, for September 1894, and also Real Stone China? The latter is difficult to read. This plate has some crazing and a small under rim chip. A truly delightful scene on this platter. Backstamp: Woodland W Baker & Co Ltd Made in England. Light all over crazing otherwise excellent condition. A most unusual pattern on this fabulous large platter printed in black. Backstamp: Trade Mark Alton JB Rd 75778. A little minor surface scratching, otherwise excellent condition. Black and gilt. Backstamp: Booths Silicon China Made in England Really unusual and so attractive. There is a little wear to the gilt on the cups otherwise excellent condition. Provenance: The Entwistle Collection. Black and gilt. Backstamp: Booths Silicon China England. Really unusual and so attractive. Both cup and saucer are crazed and there is some wear to the gilt on the cup otherwise absolutely fine. Provenance: The Entwistle Collection. A wonderful cache pot in an eye catching combination of black and gilt. Backstamp: Booths Silicon China Made in England. Light crazing of the glaze, otherwise excellent condition. Made in England. Brand new and first quality, dishwasher and microwave safe. Black Arden. Replacement lid for the smaller round 1 pint 0.6 ltr teapot. Minor variations in size may result in a replacement lid fitting less well than the original. This item has been discontinued by Burleigh and is no longer available. Made in England. Brand new and first quality, dishwasher and microwave safe. Black Arden. Replacement lid for the larger round 1.75 pint 1.05 ltr teapot. Minor variations in size may result in a replacement lid fitting less well than the original. This item has been discontinued by Burleigh and is no longer available. Made in England. Brand new and first quality, dishwasher and microwave safe. Black Arden. Large serving plate. This item has been discontinued by Burleigh and is no longer available. Made in England. Brand new and first quality, dishwasher and microwave safe. Black Arden. Saucer 5.75 ins 14.5 cm diameter. This item has been discontinued by Burleigh and is no longer available. Made in England. Brand new and first quality, dishwasher and microwave safe. Black Arden. Saucer 6.5 ins 16.5 cm diameter. This item has been discontinued by Burleigh and is no longer available. Made in England. Brand new and first quality, dishwasher and microwave safe. Black Asiatic Pheasants. Replacement lid for the smaller round 1 pint 0.6 ltr teapot. Minor variations in size may result in a replacement lid fitting less well than the original. This item has been discontinued by Burleigh and is no longer available. Made in England. Brand new and first quality, dishwasher and microwave safe. Black Asiatic Pheasants. Replacement lid for the larger round 1.75 pint 1.05 ltr teapot. Minor variations in size may result in a replacement lid fitting less well than the original. This item has been discontinued by Burleigh and is no longer available. Made in England. Brand new and first quality, dishwasher and microwave safe. Black Asiatic Pheasants. Large serving plate. This item has been discontinued by Burleigh and is no longer available.